Are We Nearing The End of the Bull Market? A Wall Street Journal article on Friday begins with this: "Stocks are hitting records and valuations are at 15-year highs, both signs of confidence. But a closer look at what is driving the rally shows that the eight-year bull market may be nearing its end." Now, you might be expecting me to dredge up an article from four or five years ago making a similar argument that was ultimately proved wrong. Indeed I could, but I won't. Instead, I'll ask a different question: If the content of this article is accurate and foretells of an impending downturn, does it matter? Of course it does, you think! Losses are painful and can prevent you from getting ahead. But let's reflect on this -- you're a long-term investor with long-term financial goals. How exactly does a short-term decline impair your long-term outcome? Answer: It probably doesn't. We've seen downturns before. A lot of them. We've even seen these valuations before, 15 years ago, if we're to trust the article. Wouldn't it be smarter to ask "How have stocks done over the last 15 years, during a period where valuations were net-net unchanged?" That's what I wondered, so I looked it up. The chart above provides the answer. The S&P 500 is +8.4% per year over this stretch, and $1 invested grew to $3.33. Not bad. A globally diversified, small/value tilted index portfolio returned +9.9% per year over the last 15 years, and $1 invested grew to $4.13. Even better. 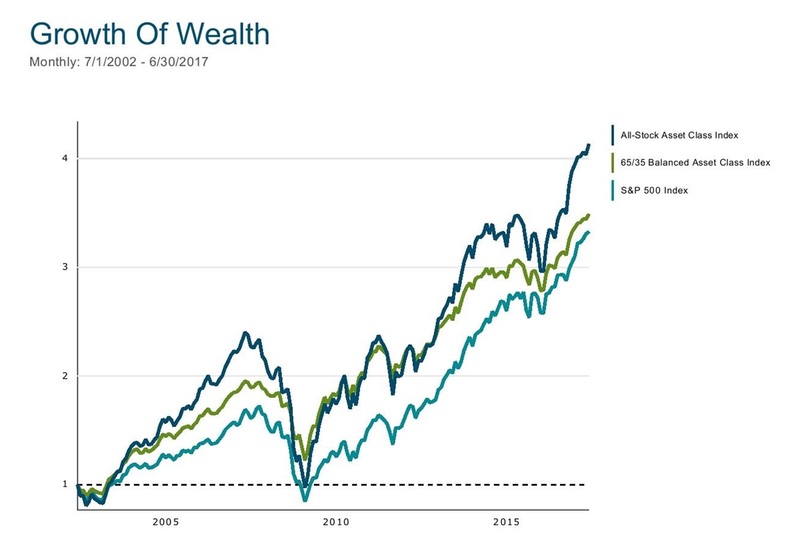 A balanced portfolio invested 65% in our global stock index, and 35% in Five-Year T-Notes, returned +8.7% per year with $1 growing to $3.49 (more than the all-stock S&P 500 with 35% less short-term volatility). For retirees, this might be the best result of all. Of course, this 15-year stretch included the worst stock market decline since the 1930s. But total returns were still sufficient, without needing to get in and out of the market at the right time, to achieve modest financial goals. Anyone who tells you they know when the market will go down is either lying, or they don't know what they don't know. What we can say with more confidence is that it is tough to profit from timing the market. In all likelihood, you will get in and out at the wrong time, and this will cost you a significant portion of your wealth. In the process, you'll be more stressed out and waste more time studying market signals and investment sentiment and agonizing over your portfolio; when you could be spending it on other, more rewarding aspects of life. Many investors are asking the question of whether we are nearing the end of a bull market. A better question is: Why should I care? Past performance is not a guarantee of future results. Index and mutual fund performance shown includes reinvestment of dividends and other earnings but does not reflect the deduction of investment advisory fees or other expenses except where noted. This content is provided for informational purposes and should not to be construed as an offer, solicitation, recommendation or endorsement of any particular security, products, or services.